Tc max-evolution with timeExperimental Solid State Physics: superconductivity, magnetism, and dielectrics at high pressure and low temperature; searching for novel superconductors; unraveling the mechanism behind HTS; raising the Tc; fabricating HTS; and developing practical uses of HTS. "Interface-induced superconductivity at ~ 25 K at ambient pressure in undoped CaFe2As2 single crystals," K. Zhao, B. Lv, L. Z. Deng, S. Y. Huyan, Y. Y. Xue and C. W. Chu, Proceedings of the National Academy of Sciences USA 113, 12968 (2016). “Cuprates—Superconductors with a Tc up to 164 K,” C. W. Chu, Section 4.4 of Chapter 4, “Materials,” in 100 Years of Superconductivity, ed. by H. Rogalla and P. H. Kes (Boca Raton FL: Taylor & Francis/CRC, 2012), p. 244. 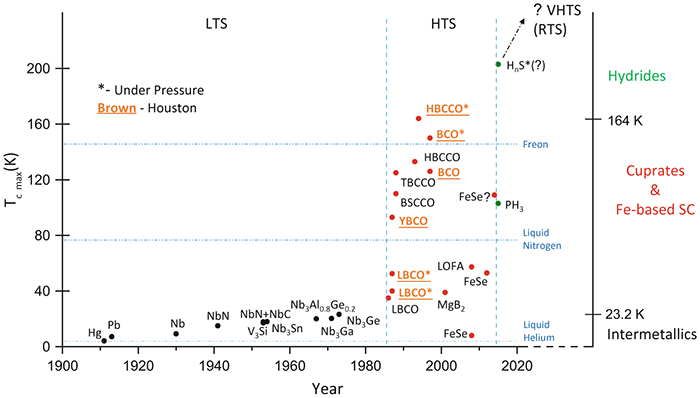 “The Evolution of HTS: Tc-Experiment Perspectives,” C. W. Chu, Ch. 16 in 50 Years of Bardeen, Cooper and Schrieffer, ed. by L. N. Cooper and D. Feldman (Singapore: World Scientific, 2010), p. 391. “Field-Induced Re-Entrant Novel Phase and a Ferroelectric-Magnetic Order Coupling in HoMnO3,” B. Lorenz, A. P. Litvinchuk, M. M. Gospodinov and C. W. Chu, Phys. Rev. Lett. 92, 087204 (2004). “Superconductivity up to 126 Kelvin in Interstitially Doped Ba2Can-1CunOx [02(n-1)n-Ba],” C. W. Chu, Y. Y. Xue, Z. L. Du, Y. Y. Sun, L. Gao, N. L. Wu, Y. Cao, I. Rusakova and K. Ross, Science 277, 1081 (1997). “Superconductivity up to 164 K in HgBa2Cam-1CumO2m+2+δ (m = 1, 2, and 3) Under Quasihydrostatic Pressures,” L. Gao, Y. Y. Xue, F. Chen, Q. Xiong, R. L. Meng, D. Ramirez, C. W. Chu, J. H. Eggert and H. K. Mao, Phys. Rev. B, “Rapid Communications” 50, 4260 (1994). “Superconductivity at 93 K in a New Mixed-Phase Y-Ba-Cu-O Compound System at Ambient Pressure,” M. K. Wu, J. R. Ashburn, C. J. Torng, P. H. Hor, R. L. Meng, L. Gao, Z. J. Huang, Y. Q. Wang and C. W. Chu, Phys. Rev. Lett. 58, 908 (1987).